A very big influence in what I watch in movies and on television and in what I write was my father’s taste in movies, television and books, God bless him. It was my dad, Leroy Ferguson, who got me into westerns, detective movies and fiction. He would devour ‘Shell Scott’ books and pass them onto me. And he would never fail to call me to come watch with him TV shows I still love to watch today such as ‘Have Gun Will Travel’ ‘The Wild Wild West’ ‘Mission: Impossible’ ‘Mannix’ and THE RAT PATROL. THE RAT PATROL for me was the best out of a number of World War II TV shows during that period such as ‘Combat!’ and ‘Garrison’s Gorillas’ as it just had more action. The Rat Patrol delighted in bounding over sand dunes in their Jeeps, blazing away with .50 caliber machine guns and flinging grenades all over the place. By the time The Rat Patrol finished a raid there wasn’t much left that hadn’t been blown to splinters or anybody left alive. The Rat Patrol is a four man commando team, three Americans and one Brit who are attached to a desert patrol group in the North African campaign. Right there that gave the TV show a unique look from any other World War II TV show at the time. 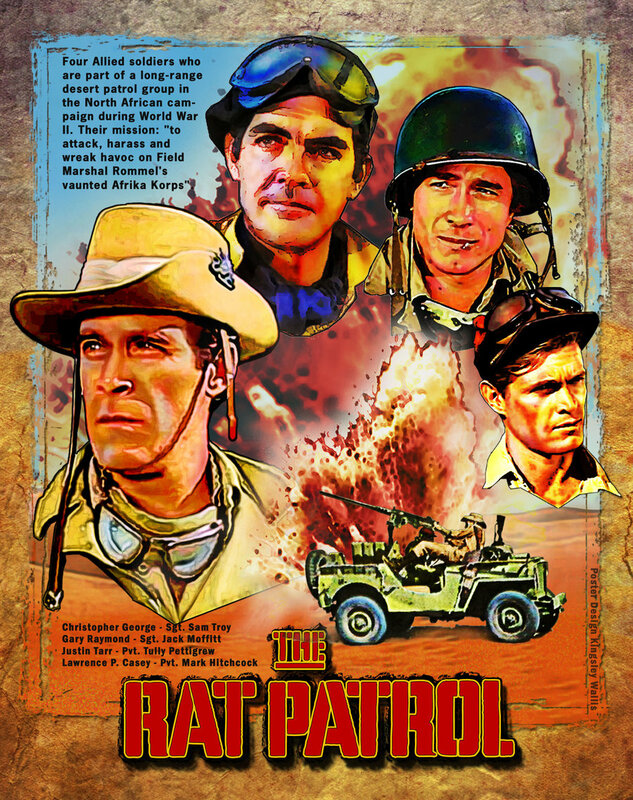 Not only did The Rat Patrol have to contend with the Nazis, led by their relentless arch-enemy Captain Dietrich (Hans Gudegast/Eric Braeden) but the unforgiving harsh desert environment was life-threatening as well. The leader, Sgt. Sam Troy (Christopher George) is a master tactician who never gives up, never says die and always pulls a last minute desperate plan out of his Australian bush hat. Britisher Sgt. Jack Moffitt (Gary Raymond) is an expert on the desert and speaks fluent Arabic, thanks to his having assisted his archeologist father on many digs in the Sahara. Moffit also speaks German better than most native born Germans, a skill that saves the team’s life on more than one occasion. Pvt. Mark T. ‘Hitch’ Hitchcock (Lawrence Casey) is an Ivy Leaguer who wears a French Foreign Legion cap and seems to attract women without trying. Pvt. Tully Pettigrew (Justin Tarr) learned how to drive and fix cars during his days running moonshine back in his native Kentucky. Through 58 episodes, these four men would wreak an impressive amount of hell in North Africa. THE RAT PATROL is a great example of what was once a television staple: the 30 minute action adventure show. There’s no room for fat or any padding whatsoever in a RAT PATROL episode and the formula isn’t hard to follow: The Rat Patrol is given a mission. Said mission goes wrong. Sgt. Troy comes up with an insane plan to salvage the mission. Mission is successful. The Rat Patrol rides off into the sunset. However, there was a lot of wiggle room in the formula such as in the episode where The Rat Patrol and Captain Dietrich call a truce to rescue an Arab girl that has fallen down a well. However there’s another German officer in the mix and he didn’t call a truce. There’s the episode where The Rat Patrol has to smuggle a safecracker into enemy headquarters to plant false information. The safecracker has a heart attack and Sgt. Troy has to figure out a way to get the guy out without the Germans knowing they were ever there since that would blow the mission. There’s the episode where The Rat Patrol is captured by an American gunrunner who expects the Patrol to make good on their blowing up several his shipments as the Patrol thought they were German weapons. And for a show that’s only a half hour long, there was still room for some characterization, especially with Captain Dietrich. As portrayed by Hans Gudegast, who is better known now as Eric Braeden, Dietrich is a German officer of great skill and even greater honor. He’s shown several times to be anti-Nazi and there are several episodes where he is forced to call a truce and team up with The Rat Patrol. In fact, there are so many episodes where Dietrich just lets the Patrol go even after they’ve left smoking craters where his bases used to be and killed all his men that I suspect he’s secretly working for The Allies. So should you watch THE RAT PATROL? If you’re in the mood for tough, no-nonsense action adventure that’s just as much fun to watch today as it was back when it originally aired during the 60’s, absolutely. THE RAT PATROL is available on DVD for you to watch and enjoy. I see it now. Kingsley Wallis did. I LOVE The Rat Patrol. That’s some snazzy artwork. Did you create that yourself? Very cool.